Few Gospel texts arouse as much reaction as today’s reading (Matthew 6:22-33). It would seem that every “starving sparrow” contradicts Jesus; every famine and every war; the text appears to be extremely simpleminded and naive about economic problems; and it appears to encourage laziness. All these are questionable criticisms, but understandable if you only take this text at face value and not dig deeper. Jesus is not naive about economic needs; he understood perfectly well how the world functioned. His purpose in this section of the Sermon of the Mount was to encourage an unconflicted, undivided existence. The key word in the Greek text is for they eye to be ἁπλοῦς. The usual translations, “sound” or “healthy”, don’t do it justice; they sound too medical, as if you need contact lenses or new glasses. The more important meaning of the word ἁπλοῦς is “simple,” “single” as in “being motivated by singleness of purpose so as to be open and aboveboard, single, without guile, sincere, straightforward i.e. without a hidden agenda” (A Greek-English Lexicon of the New Testament and Other Early Christian Literature, 3rd Edition). The two words Διὰ τοῦτο connect the statement about the ἁπλοῦς state of being to what follows. One writer calls it “intentional Jesus language” (Ulrich Luz, Matthew 1-7, Hermeneia – A Critical and Historical Commentary on the Bible, 2007). It is indeed, very intentional language that Jesus uses – always. To read the statements about the birds of the air and the flowers of the field out of context, separately from the words about the ἁπλοῦς eye is to miss the whole point! 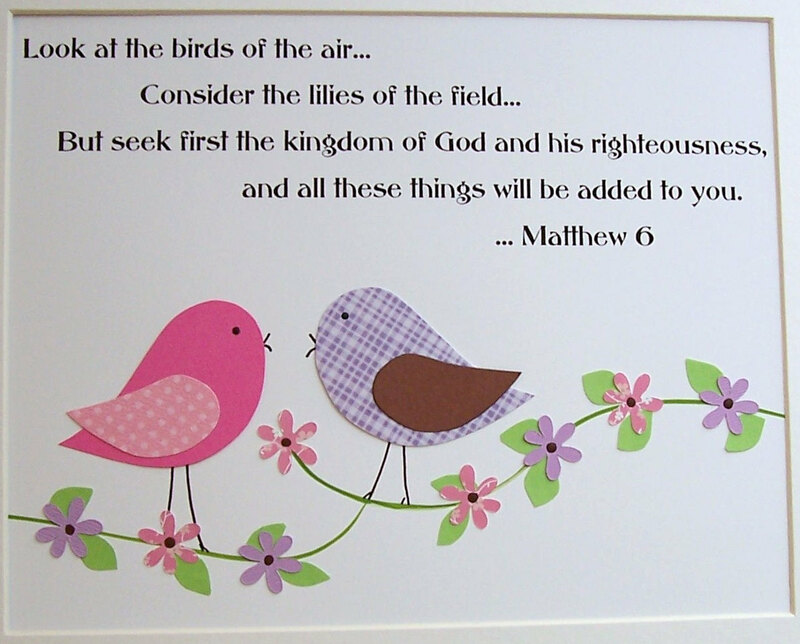 And finally, “Seek first the kingdom of God and God’s righteousness,” and everything will fall into place. Your work, your planning for the future, your ability to face each day’s challenges – you will have the clarity of mind and calmness of heart to choose priorities and make decisions. Far from being naive, Jesus is acutely perceptive and psychologically accurate. Flowers and birds are images of undivided holistic existence. Even the “kingdom of God” can be seen as a symbol, an image of something beyond conception. Flowers and birds are only images and symbols, just like fish and sheep that I spoke about last week. Don’t let these images blind you to the message. But perhaps that’s part of the problem, isn’t it? Perhaps it is our distance from nature that creates such conflicted priorities in our lives! And here is something else to think about. The tragedy in Charleston this past week has raised many troubling issues. Much attention has focused on the shooter’s posing with the Confederate flag that continues to fly in the State House of South Carolina. But there are also photos of the shooter burning the American flag. Even though Jesus did not have flags and racist shootings in mind, his teaching is very much applicable to what happened in Charleston. South Carolina can’t have it both ways. Flying the US flag with the Confederate flag is a contradiction; those two flags don’t go together, they stand in opposition. The shooter made his choice. He chose the Confederate flag that represents racism, slavery, and a nation torn apart. And he burned the US flag. He made his choice. South Carolina has to make a choice. Is it part of the United States? Then fly the US flag and take down the Confederate flag! That now is becoming a campaign, and even presidential candidates from both parties are joining their voices to the public outcry. Symbols have meanings. What symbols do you choose for your life? There’s a good question for self evaluation for all of us. Divided loyalties don’t work in personal life. They don’t work in civil society. This little corner of Jesus’ teaching can be applied to practically every aspect of human life. Did you notice the Pope’s brilliant encyclical released last week? How he connected climate change and environmental issues with economics and social justice? That’s how the teaching of Jesus works – has to work! Everything is connected because everything revolves around whether or not we seek first the kingdom of God and God’s righteousness. Categories: Sermons | Tags: Charleston shooting, divided loyalties, Sermon on the Mount, singleness of heart | Permalink.